So we want to create a museum to replace the historic building we are selling? How does this help us “strengthen and support Unitarian Universalism in the world!” as it states in the promotional materials? I get it that our staff needs a more modern space to do our work, and a museum is a fine idea. 25 Beacon’s main advantage was its history and that it was on the Boston Common right next to the State House. I was saddened by the decision to move our headquarters, but I also have respect for our elected leadership who researched the various issues thoroughly before deciding. And yes, it is going to take money to make the new space on Farnsworth what it needs to be. But as a national fundraising campaign, it just doesn’t work for me. I have no clue as to what kind of sermon I could write. It is not something I can get very excited or passionate about. I couldn’t even find the “worship resources” that the blog says are there. I looked on the UUA website too. Zip. Maybe there is a reason for that. A common phrase used by ministers is , “That will preach!” Frankly, in my opinion, “Join the Move”, won’t. There is also a class issue involved and perhaps a racial one as well. Middle class white people of all ages can tend to have a sense of entitlement. The truth is that most of our younger ministers grew up as Unitarian Universalists, most commonly in white middle class liberal suburbs of major metropolitan areas . It makes sense that those are the kind of places they would expect to serve. It is what they have known after all. But if we are to grow this faith, to reach out to diverse communities that are yearning for our message, we have to move out of the suburbs and stop catering exclusively to the white middle class intellectuals that make up the bulk of those suburban churches. It isn’t our history, and it may be a cultural death trap that we have fallen into. The very nature of suburbia is a lack of diversity. They were designed to be that way. People of color could be and were unable to legally purchase homes in most of them. (read Sundown Towns by James Loewen for more information on this.) The price of the homes meant that everyone one buying in to a subdivision had virtually the same income level. Why are we now a largely suburban faith? We didn’t start out that way. The Unitarians were in cities and tended to attract the educated urban elite. The Universalists, on the other hand, were more likely to be found in rural communities and their congregations were composed of farmers and working class people. We can be a faith that engages a whole lot more people that we are not reaching now. We have done a lot of work on racism within the Unitarian Universalist Association. There is more to do, but in an increasing multicultural world we at least know we need to do more of this. We also need to work on classism. It is also interwoven with racism and ageism. It is diametrically opposed to all of our religious values. That conversation has barely begun. I said above that most of our newer younger minsters tend to come from white middle class communities, The same is not as true about those of us that found this faith as adults and answered the call to ministry later in life. Many of us grew up poor or working class. In my own case, neither of my parents graduated from high school. My mother worked in low paying service industry jobs her entire life, primarily as a waitress. My father, who only had an 8th grade education, was able to land a job as a small town automobile painter and body man. I got a full scholarship for a university education, back when such things were possible, and have led a relatively middle class existence since. I have not forgotten my roots, however, and it is very easy for me to relate to the working class folks that are now coming to our church. Drive a truck for a living? I have 3 cousins that do that. I know in my gut that the amount of education one has has zero to do with how smart you are, or how compassionate, or even how generous. The job you do and the amount you are paid is irrelevant to whether or not you might be attracted to a free and empowering faith such as ours. When our church let the local Occupy Group camp on our lawn, it was a challenge in many ways, but much of the support for doing so came from the members of our church who themselves had been homeless, who had lost their homes in the mortgage crises, who were struggling financially. Folks that had little money for themselves were preparing meals for the campers and attending endless meetings. I have gone off the topic of ageism a bit, but our younger more class privileged ministers need to get out and get their hands dirty right here in this country not on exotic mission trips where they can feel righteous about how much they have accomplished. I am not up for mission trips anymore. I did go to Biloxi with the UUSC back in 2007. We did some good, but there was still a disconnect. On that trip, it was interesting how only a few of us understood any of the class issues. The middle class people complained about the quality of the food. It was “welfare” food, government surplus, the stuff I grew up eating at my own and my friends houses. Don’t look to do ministry only in Massachusetts, Florida, or California. Go where you are scared to go. That is where people need you the most. That is where the real ministry is. The fabulous church I now serve had a very hard time attracting a minister – even though it was a full-time fair compensation position and a healthy vibrant social justice oriented congregation. It doesn’t pay big bucks but the cost of living is low. It wasn’t about the money but was instead I believe more of a reluctance to move to a place like Utah. It is a challenge at times. My closest UU colleagues in the state are miles away and there are only 3 of them. It is a conservative state. My marriage is not valid here. I could make a long list but I won’t. Because this is what ministry is: ministry should be, heart and soul, about service. Your age doesn’t matter. Just your willingness to serve, wherever you happen to be called. Open your ears. I posted an old poem today. (click) I did it because of an online conversation where some folks seemed to be suggesting that getting a younger minister will attract more young people to church. That is just wrong and it makes me grumpy. Yeah, I am a grumpy old woman and proud of it. I wrote the poem after an incident at the Unitarian Universalist Ministers Association’s Institute for Excellence in Florida last January. I was at a large table for a meal, and overheard several young ministers complaining that more older ministers needed to retire so they could find churches to serve. They obviously felt they could do a much better job. I did go back after awhile and speak with one of them. She “hadn’t meant to be offensive.” But she was clueless. I too am a fairly new minister. I have only been ordained for seven years, even though I easily had 25 more years of life experience than she did. Ministers of all ages and experience do need to keep themselves fresh by attending things like the institute. Age alone is not a predictor of competence in the ministry OR in attracting new and younger members. Fresh out of seminary, I certainly did not expect, as they apparently did, to be called to serve a largish congregation in a fun metropolitan area. I ended up at a relatively small church in Ogden, Utah and what a blessing it has been despite the challenges of this very conservtive state. We are making a real difference here, however. There are plenty of pulpits available at small relatively isolated UU churches all over the country. I doubt that these complainers were even looking outside of their dream locations. At age 63, I am also serving one of the UUA’s more youthful congregations. The average age of the adults is somewhere in the 40’s to early 50’s I would guess. We have quite a few young adults that attend frequently. Children and youth participate fully in our worship services. (click to see article on this) We do not “sing them out” and then proceed with a boring lecture type sermon as happens in too many of our churches. Our worship and music is lively and varied. (We also have a fabulous music director and a talented pianist.) Many churches are worried that they are dying, because everyone in the pews has grey hair. They may in fact be dying, but it is not because they have old people. It is because they are resistant to change and are doing almost everything the way they did 20, 30, or even 50 years ago. They have also forgotten about any mission outside of their church walls. New members bring change. They bring theological and other types of diversity. Mission related activities particularly in the area of social justice also bring change. Worship styles change. Change is good. It means you are alive. It means the church is alive. Young people can get stuck in ruts too. Anyone can. What we need to do as a religious movement is let the spirit in, let it move us to the next level. Try different things. Do things. It almost doesn’t matter what, as long as the heart is the motivation. People in my church (including some quite a bit older than me) often refer to me a “Mother Theresa,” not a title that would make sense if I was in my 30’s. But it doesn’t matter. Chronological age shouldn’t matter. If we are true to this faith and the promise of a beloved community, then what will matter is how much and how strongly we love – each other and the world that needs us. Ok, I am not so grumpy anymore. Let me in let me play. To stick out my neck. If your ears hear the call. This faith needs us all. There have been many reports in the news lately of the generation gap on the acceptance of LGBT people. Most younger people just don’t see sexual orientation as a big deal. Some of the reason for this is, of course, that most young people these days have a least one friend or family member who is openly gay. Some of the credit for the change, however, also needs to go to those of us who have been raising children within our same gender relationships for the last 25-30 years. Before the 1980’s LGBT people were raising children, but most of these children were the result of prior heterosexual relationships. In the 1980’s, however, artificial insemination became available to open lesbian couples. If you didn’t have a sperm bank in your own state, you could travel to one, or even do it all via the mail. It wasn’t cheap, but it was possible. Adoption and foster-parenting also became more common among LGBT people, some being open about their relationships and others posing as single. It was the beginning of the “gayby boom” and that boom has continued. Some research even suggests that lesbians are now just as likely to become parents as heterosexual women. Gay men are adopting in ever greater numbers and some are also using surrogate mothers. The impact of discrimination on the children of LGBT families was one of the arguments that led to the overturn of DOMA. Once you become a parent, it is impossible to stay in the closet. One, it wouldn’t be good for the kids if they thought you were ashamed of your family, but beyond that, kids will out you all the time. They say loudly in the grocery line, “Mom, mama says we need to buy more milk.” They talk about their parents at school. You attend school and athletic events and other kids come over for sleepovers. Maybe you join a church. We joined a Unitarian Universalist congregation when our kids were young partly because we wanted to raise them in a supportive religious community. I have heard (either directly or from their parents) that several young people who grew up in that church and later came out as LGBT, feel that knowing our family made their own coming out process much easier. It is a little funny, but whenever we go back to the town where we raised our children, people we couldn’t pick out of a line-up recognize us. 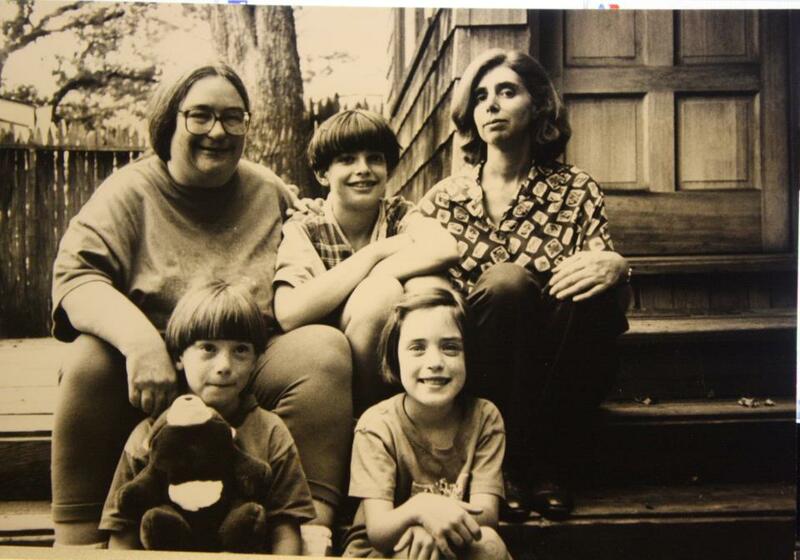 We were the lesbian couple with the 3 kids and everyone knew us – and still knows us – on sight. Our kids had friends. Their friends knew us as parents just like their own. We fussed at them just like their parents did. Our kids complained to them when they were grounded or when we said “no” to something they wanted to have or do. We were just parents; weird to their children in a variety of ways just like all parents are. No wonder their friends all grew up to think sexual orientation is no big deal. Multiply our experience by the hundreds of thousands of families like ours. Multiply it by all the friends of all the children who grew up in GLBT households. Thanks, kids, you helped make it possible for your parents to finally get legally married. Photo is from 1991-1992 I think. My long time partner and I were legally married in California on July 12, 2013. How weird it is to be in Utah now. How weird the trip home felt. In California, we went shopping for wedding rings for the ceremony we are planning in January. Such a joy it was. Yes, the matching rings are for us. Smiles all around mostly, although one jeweler made no comment. Maybe that is the way it is supposed to be. Just another couple getting married. Normal, everyday, commonplace, so why comment? Still, I think we made him a bit uncomfortable. No matter, plenty of others wanted our business. We went out to dinner with friends who announce our new status to other friends they see. We tell almost everyone we meet. It feels good. It feels real. Then we crossed the border into Oregon, “Oh, are we still married here?” Well no, not yet at least, but they are at least working on it. Federal recognition only in that state. We “honeymooned” in Oregon but it wasn’t as easy as California had been. We did not share our news with any strangers there. Then the honeymoon and our vacation was over and we entered Idaho. It felt downright creepy being there knowing that most people there would not welcome us as we are. We have been to Idaho many times, but this time felt different. Married we were finally, but it felt like we were strangers visiting a foreign land. Utah felt a little better. It has been our home for six years. There are people we love here, that are happy for us. I serve a fabulous Unitarian Universalist church here. My congregants were excited to learn we had gotten married. Federal laws should still apply here, despite our legislature’s crazy impulses to secede from all the one’s they don’t like. But it does feel odd to be married here and also not. When asked if I am married I will say yes now, to doctors, dentists, anyone. I will say yes because it is true, even if Utah says it is not. But it does feel strange. I have not been in the closet here at all. But somehow, being told that “domestic partner” is not a relationship category here, wasn’t quite so offensive, and at least I was used to it. Now I will be out as a married woman. I changed my middle name when we signed the marriage license and now I will need to change all of my federal records. I’ll try the Social Security office first, and hope they have gotten the word, even here in Utah. We will see how that goes. I will let you know. For years, it has been obvious that the delegates to General Assembly (GA) do not necessarily represent their congregations. It is expensive to attend so those that go tend to be people who can afford to go. They are the people who can afford to take time off work or who are retired. Ministers go, at least if they have enough professional expenses available. Ministers should be there and they should also attend ministry days, in my opinion. An annual dose of collegial connection and inspiration is critical if we we are serious about maintaining excellence in ministry. But if they can’t afford it, they don’t go. That tends to include, I suspect, a large percentage of our ministers that serve part-time in our smaller, geographically isolated congregations. Many of those congregations rarely have anyone attend. When their minister, if they have one, can’t afford to go, they are not only disenfranchised but also risk disconnection from our larger faith community. Very few congregations provide funding for any of their lay leadership to attend. Several years ago, the UUA paid the registration fees for congregational presidents. That was a very good thing. I am not sure why it stopped. During the brainstorming session (Which was recorded on twitter @#newuuaga) I suggested that we find a way for the UUA to subsidize delegates who would actually represent their congregations. If it the subsidy went only to congregations that are fair share, it would also encourage more congregations to be fair share. As Vanessa Southern said in her sermon at the Service of the Living Tradition, “Big missions don’t happen on starvation budgets.” If we really care about an inclusive democratic process(and we should), we need to do something. I had thought that the provision to have off-site delegates would help. Then I discovered that off-site registration also costs, and not a nominal amount. Our church board actually designated one of our board members to be a delegate – and then we found out that it would cost $150 for her to register. I can understand charging something, but $25-30 dollars would be fairer. We likely could have squeezed that amount out of our church budget, but the $150 was simply too much. What happens at GA should not stay at GA.